Hence, finding good advisors to assist you will save you time and money. We as a group of professional accountants, tax specialists, business advisors and consultants from Kuala Lumpur are able to offer you valuable advice and assistance. Through contacts with business owners in Malaysia, we realized that many do not have adequate access to information on doing business in Malaysia. To address this gap, we have put up plenty of information on this website that will be useful to your business. Do you have a question on doing business in Malaysia? Is there a particular service like Audit, Tax or Advisory that you are looking for? 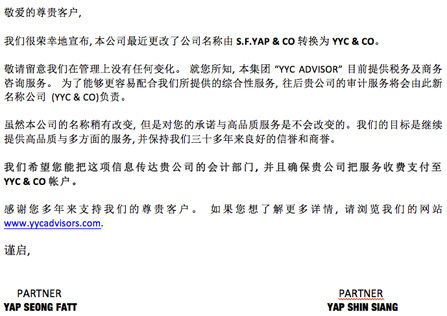 We are pleased to announce that we have recently changed our Firm's name from S.F.YAP & CO to YYC & CO. Please be advised that there is no change in management. As you may already know, we currently offer our taxation and business advisory services through our "YYC Advisors" brand. Providing our audit services under the shared brand name is the next step in our rebranding efforts in order to better align with our integrated array of services. Though our name has been changed, our commitment to our clients and its continued success has not. Our goal is to continue to provide you with high-quality, responsive services and to keep up the good reputation we have had for over 30 years. We would appreciate if you would bring this announcement to the attention of your accounts department and direct them to make all payments to YYC & CO. Thank you for being one of our valued clients and your support throughout the years. Should you want more in-depth information about us, please visit our website at www.yycadvisors.com or please give us a call if you have any questions.